Several methods can be used to fish a dry fly. Dead drifting, skating, and twitching are probably the more popular methods employed when manipulating dries. Casting upstream and using the current to drift the fly downstream is called dead drifting. This means that the fly is floating at the same speed as the water and anything else that happens to be drifting down the stream on the surface. This is avery effective method to deliver spinner and dun patterns to unsuspecting trout cautiously sipping flies from the surface, and it appears most natural to the fish when drifted in this manner. To keep the fly drifting at the appropriate speed, you'll probably have to mend the line a little. To do this, gently 'flick' your line upstream, to halt any drag created by the current grabbing the line and pulling it downstream faster than the current is moving. This will be necessary particularly when fishing with long casts over several areas where the current may be travelling at an inconsistent speed from one point of the river to the other. You may also want to try twitching the fly as it drifts downstream. This will often result in strikes from otherwise lazy fish that may not notice your fly as it drifts downstream motionless. In performing long casts with tiny flies, it will become increasingly harder to see your fly as it drifts. Try to notice where the fly is, based on where the end of your fly line is and where you expect your fly to be. Use the foam or other debris floating with the current to judge the speed at which your offering is drifting at and try to match that speed. During your time on the water, you'll probably come to notice flies skittering and bouncing on the surface of the water. This can be a result of different habits of the different species of fly you'll encounter on the stream. This can be imitated by presenting your fly in such a manner that it is skating across the surface. To do this, position yourself upstream of the fish so that you are able to cast downstream towards him. Cast on a slight downstream angle towards the far bank to measure your line and allow the fly to drift downstream while the current pulls it towards you. Once the line is directly downstream of you, gently pick up the line and repeat the cast. This time, as the fly touches down on the water, simultaneously lift your rod tip high in the air to prevent most of your leader and all of your fly line from hitting the water. Now, as the fly begins its drift downstream, follow it with your rod tip held high, keeping a gentle sort of tension on the fly. The effect you are seeking here is to have your fly bounce and skate across the surface of the water as it is pulled downstream and towards you, eventually ending at a point directly downstream of where you are standing. Once the fly has reached the point where it is downstream of you, DON'T be too quick in lifting your line and casting again. Keep the fly in this position bouncing and twitching for several seconds or more before repeating the cast. Always raise your line gently as it will be sitting right above suspected fish, and the loud splash or pop that is created by lifting your fly too quickly will spook them and put them down for a while. 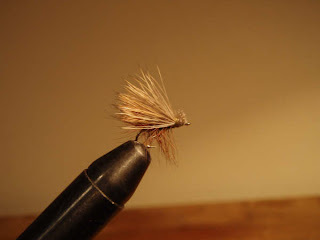 Elk Hair Caddis patterns are high floating, high visibility patterns. Great for novice fly folk because they are so easily seen on the surface, even at great distances. Tie these flies in the colours and sizes that reflect their natural counterparts.